To us film fans George Bernard Shaw is most famous for being the original author of Pygmalion that was adapted to the screen in 1938 and again under the name of My Fair Lady in 1964. While the Pygmalion film was his most successful adaptation during his lifetime, he didn’t shy away from his other plays being adapted into films when he met his creative equal Gabriel Pascal. 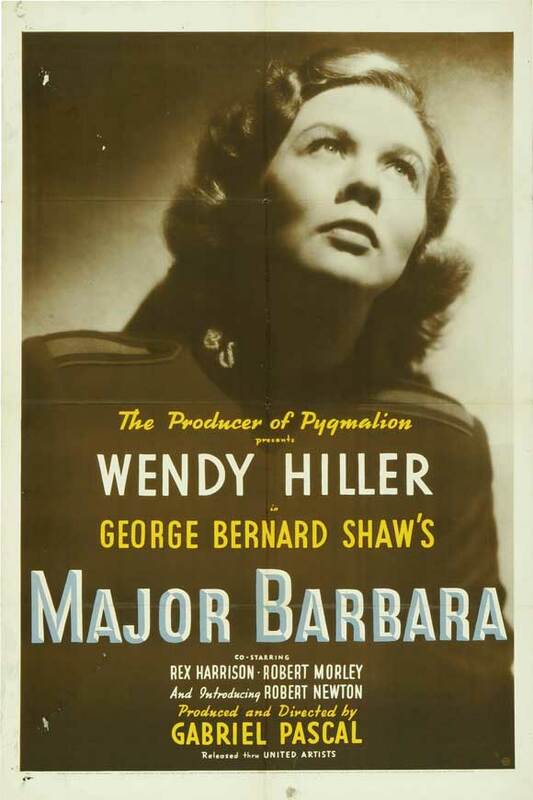 Pascal and Shaw worked together to bring another one of his beloved plays to the big screen: Major Barbara. In fact Pascal and Shaw decided to adopt several of Shaw’s plays together in order to bring his talkie politics to the non-theater going public. While the last two adaptations were failures, Major Barbara was able to capture the spirit of the final days before the start of WWII in England very well. Barbara comes from a very wealthy family. Her father made a fortune in manufacturing cannons for warfare, but is now estranged from the family. Barbara rejects this war profiteering and joins the Salvation Army (hence the title Major Barbara) to devote her life to charity and her ideals. Dolly (this is a male character… just wanted to clarify here before you become confused) sees Barbara preach one day about charity and loving God to help get through your troubles and he is enamored. Despite being a Greek Philosophy intellectual with little money and high dose of cynicism, he joins the Salvation Army and courts Barbara. Dolly then finds out that she is quite wealthy and is astonished by how her aestheticism can be present a person while also living in such a grand mansion. Dolly and Barbara fall in love and continue their charity work for some time. But her mother worries that Barbara will not be cared for after she and her husband dies. She must secure a stable and safe life for her. So she brings her father back into the picture. Her father is used here mainly to shake up Barbara’s ideals. He donates a signficant amount of money to her charity, despite her objections for using dirty money (war profiteering) for good. But her more pragmatic superiors take the money and she quits the Salvation Army. Her father then persuades the family to come visit him at his factory and see the work behind the life he has provided for him. Dolly, once a dallying academic with no ambition, sees the factory and immediately becomes obsessed with commerce. Barbara also sees the good her father is making by providing jobs and a stable life for many people. Dolly and Barbara now turn from charity workers to factory runners. This movie is stuffed to the brim with political commentary. Shaw was just as famous for his politics as he was for the turn of phrase he initiated in every line of dialogue. But the political ideals he has been championing throughout the film is spoiled by the idealistic ending. While Barbara and Dolly decide to turn to business as a way to help mankind, the film seems to say that commerce is the ultimate tool in charity. Don’t waste your time on non-profits. This comes after nearly an hour and a half saying the exact opposite. That charity work shouldn’t be tainted by pragmatic views. This is probably the major flaw with the movie. It’s message is confused. I think if this movie wasn’t made on the eve of World War II in England, the ending probably would have been very different. This film cannot completely separate its theatrical background. Each scene feels as if the people are on stage projecting and facing towards the audience in order for them to hear their voices and see their expressions completely. The dialogue is the focus of this movie, not the cinematography or even the character development. The two leads, Wendy Hiller (who played Eliza Doolittle in the 1938 version of Pygmalion) and Rex Harrison (who plays Professor Higgins in the 1964 version of Pygmalion; My Fair Lady) handle the dialogue in the only two proper English people can, expertly. To hear their sing-song delivery and witty turn of phrases was a delight. In fact this is what saved the movie from being a boring mess. I could probably listen to them read ingredients off of cereal boxes and feel riveted. If you want to see an excellent adaptation of Shaw’s work watch Pygmalion. This film is pretty forgettable and light in comparison to that beautiful adaptation.